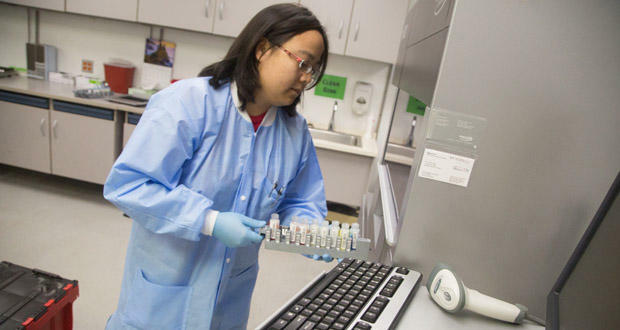 Tamiko Cabatic prepares blood samples for blood typing and screening at the Oklahoma Blood Institute in Oklahoma City. Greater Oklahoma City Chamber of Commerce president Roy Williams says the chamber got involved in research policy seven or eight years ago when a bill would have banned embryonic stem cell research in Oklahoma. It also would have prohibited partnerships with any out-of-state companies that are involved in embryonic stem cell research. Dr. John Armitage, president and CEO of the Oklahoma Blood Institute, says the industry doesn’t receive much attention of focus, despite efforts by the Oklahoma Health Center Foundation. Improving the state’s posture on the sector and the financial opportunities it provides would expand the investor base, Armitage said. That would speed the process on getting technologies and other innovations to the market. Journal Record editor Ted Streuli, in his weekly conversation with KGOU about business in the state, said not enough Oklahoma students are prepared to work in biotech. “Educators and industry are both clamoring for more science and math classes, the STEM curriculum we hear a lot about. But school funding is so far below the norms, they just can’t keep pace. Schools say they need another $2,000 per pupil every year,” Streuli said. Jacob McCleland: Ted, as far as economic development goes, what has been Cornett’s legacy? Ted Streuli: Well certainly ushering through MAPS 3 will be the biggest one. And he’s also been able to develop the economy by bringing a lot of national attention to the city, with having a hand in getting the NBA’s Thunder here, serving on the U.S. Council of Mayors and bringing them here twice to see the city. McCleland: Cornett will leave office in 2018, and later that year we’ll have the gubernatorial election here in Oklahoma. Is Cornett planning to run for governor? Streuli: Well, Jacob, he hinted that he might. He’s certainly shown an interest in higher office in the past. He’s run for Congress a few years ago, but he said that campaign would be a lot to bite off and while he said he’s planning to look into it, he’s not ready to commit to it just yet. McCleland: Right now, who is on the short list to run for mayor? Streuli: County Commissioner Brian Maughan and Cornett’s former chief of staff, state Sen. David Holt, have already announced plans to run. City Councilman Ed Shadid ran against Cornett in the last mayoral race. He said he’s considering another run, but those are the only ones we know about so far. McCleland: Really, in the big picture, how much of a role does the mayor really have in shaping economic development policy in Oklahoma City? Streuli: Oklahoma City has had only three mayors since 1988 and each of those three have played a pretty big role. Ron Norrick was the driving force behind the first MAPS initiative, which led to the Bricktown Ballpark, the canal, the river, the library and a lot of other key projects. And without those, companies like Continental Resources and Devon Energy might well be in Houston by now rather than downtown OKC. But it’s hard to measure. Kirk Humphreys followed with MAPS for kids, and then the city’s longest-serving mayor, Mick Cornett, has guided MAPS 3, Project 180 and other initiatives that have directly affected economic development and the taxes that come with that. McCleland: I want to turn our attention now to a story by Catherine Sweeney about Oklahoma’s biotech industry. She calls it a budding sector, but it’s facing a number of hurdles. We’ll start with one of those hurdles, and that’s the political one. How have politics hampered biotech growth here? Streuli: Well one way it happens is with bills introduced by legislators that score a lot of campaign points with conservative constituents, but they also brand Oklahoma as unsupportive of research. One such bill that was fought arduously by the chamber of commerce would have banned all links to stem cell research, and that really deters biotech companies from considering Oklahoma as a potential home. McCleland: Biotech faces funding shortages as well. Are we talking about public funding for research, or a lack of private investment? Streuli: Well really it’s lack of private investment at the moment that’s the biggest problem. Industry insiders told us that’s because there just isn’t enough attention being paid to what they’re doing. McCleland: The other big challenge that was mentioned in the story is education. Are Oklahoma students prepared for these types of careers? Streuli: Not enough of them. Educators and industry are both clamoring for more science and math classes, the STEM curriculum we hear a lot about. But school funding is so far below the norms, they just can’t keep pace. Schools say they need another $2,000 per pupil every year. McCleland: As we know, the foundation of Oklahoma’s economy is strongly based on the energy sector. But that’s a really volatile sector. Do business leaders see biotech as a way to diversify what the state’s economy is based on here? Streuli: Some of them certainly do. There was a lot of ballyhoo around that as the city’s medical center developed. But there’s concern now that the industry has kind of been forgotten and that growth in that is really kind of stagnating.